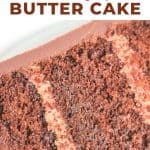 This from scratch chocolate butter cake is super moist and easy to make. 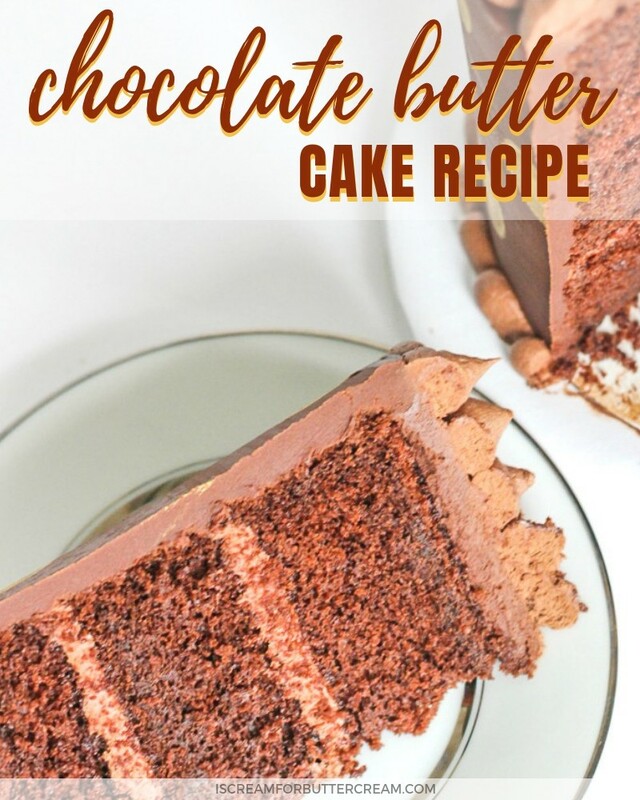 Because it’s actually a chocolate cake with butter recipe, the cake has a really rich flavor to it that’s perfect for birthdays, or any time you feel like a homemade chocolate cake. Ok, you might know that vanilla cake is my favorite, especially this one. I feel like most people, except for me, pick chocolate cake as THEIR favorite, so I wanted to give myself a challenge. The challenge was to create a chocolate cake that I felt was as tasty as my favorite vanilla one. Now, that’s a challenge coming from this vanilla cake enthusiast, but I think I have done it. 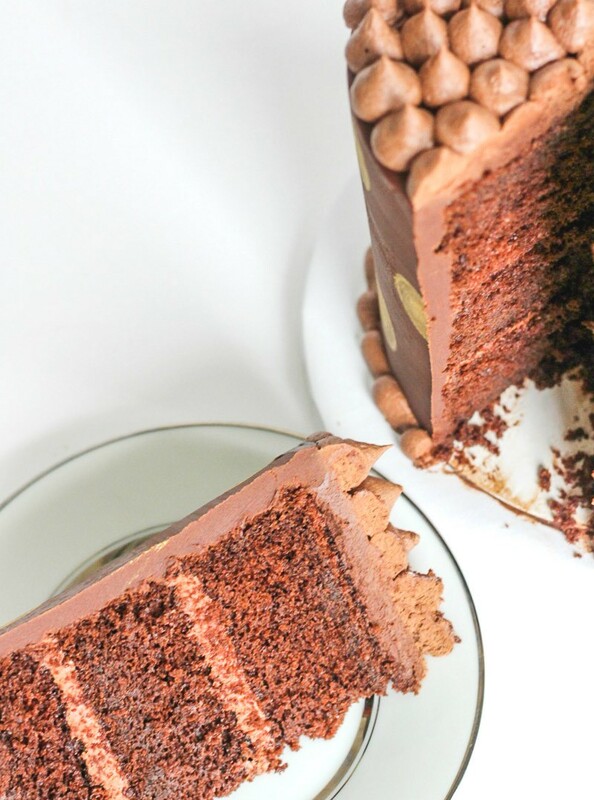 This Chocolate Butter Cake is super moist, but it’s not a complete chocolate overload. Most recipes for chocolate cake that I’ve made, call for all oil and no butter. The oil really makes the cake moist, but I just prefer the denseness and the taste of a butter cake. So, I went about creating a chocolate butter cake that would actually stay moist. I LOVE this chocolate cake. Yep, you heard me right. I actually said I love a chocolate cake. Mark that one down on your calendar. This cake has a dense crumb, but still light (does that even make sense?). It’s made with real butter with just a bit of oil. I love it because I’m not so overloaded with a super chocolaty flavor and I can still taste the butter flavor coming through. It also doesn’t feel as spongy as some of the oil chocolate cakes do. I also used brown sugar which gives the cake a deeper flavor and provides extra moisture. For the liquid, I went with coffee. As my mom would always say, “Don’t knock it ’til you try it.” I promise you this cake won’t taste like coffee. In fact, you won’t even taste the coffee at all. It just helps to bring out the other flavors. This recipe is now my best ‘go to’ chocolate cake. It’s simple to make (no complicated steps) and it’s great for birthdays, or practically any other time you feel like chocolate cake. 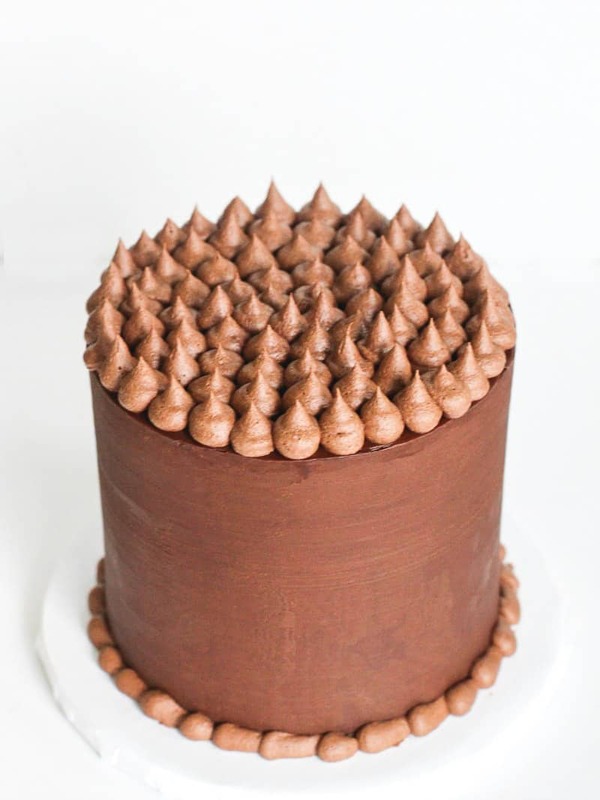 I filled this cake with my double chocolate buttercream and then covered it with ganache. The ganache forms a firm shell around the cake, but it’s still easy to cut through. It does have a super chocolaty taste. This cake would also be insanely good if you just covered the entire thing in the chocolate buttercream instead of ganache. Just go with what you prefer. If you really can’t stand the idea of adding in coffee (remember, it won’t taste like coffee, it just enhances the flavor of the chocolate), you can actually just use really hot water instead. The cake will still taste good. Should I use dutch cocoa or regular cocoa powder? Use regular cocoa powder. When you say brown sugar, does it matter if it’s dark or light brown sugar? It doesn’t really matter. Just use what you have. I used light brown, but dark brown is fine too. 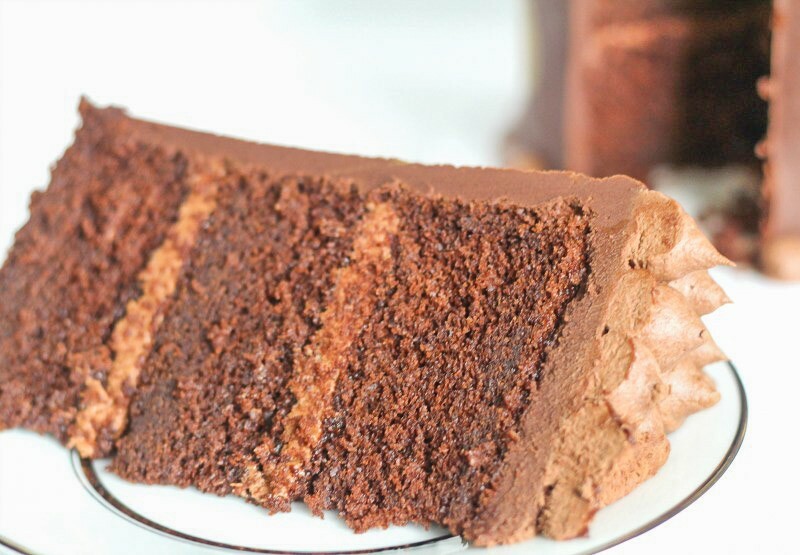 This chocolate butter cake has a wonderfully rich buttery chocolate flavor. It has a tighter crumb, but remains moist. Pair it with chocolate buttercream or ganache for a super chocolaty treat everyone will love. Preheat oven to 350 degrees. Grease and flour two 8 inch round pans. In a mixing bowl, add the room temp butter and the brown and granulated sugar. Beat on medium for about two minutes. In another bowl, mix together the flour, cocoa, baking powder, baking soda and salt. Set aside. In a separate bowl, mix together the oil, vanilla, milk and eggs. (You'll add the coffee later.) Set aside. Now you'll add in your dry and liquid ingredients alternately. Take a third of the flour mixture and add into the butter and sugar mixture. Beat on low/medium just until combined. Add in half the liquid ingredients (not the coffee yet) and beat on medium just until combined. Add in the next third of the flour mixture, mix, then the second half of the liquid mixture and mix just until combined. Now add in the last third of the flour mixture and beat just until combined. Add in the hot coffee and mix until well combined. Don't over mix. Once it's combined, stop mixing. You don't want to mix for several minutes, that's too long. Pour into prepared pans and bake at 350 degrees for approximately 35 to 40 minutes. Set on wire racks to cool for about ten minutes, then turn out the cake layers onto the racks and remove the pans to cool completely. 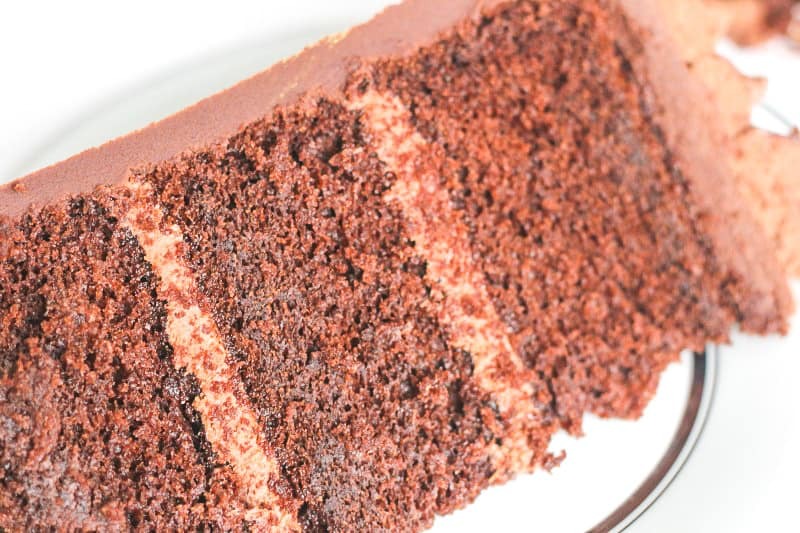 This cake does not need to be kept in the refrigerator, unless you've added perishable filling or frosting. This cake can be frozen for up to a month if wrapped well in plastic wrap and foil. 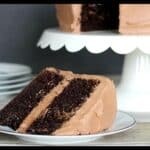 My double chocolate buttercream recipe is delicious on this cake. Nutritional information is for the cake only and does not include icing or filling. 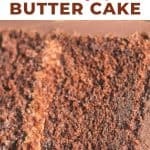 GET THE FREE DESIGNED PRINTABLE RECIPE CARD FOR THE CHOCOLATE BUTTER CAKE PLUS THE PASSWORD TO THE RESOURCE LIBRARY. Just fill out the form below! I hope you enjoy this cake as much as I do! 1. What alternative can you use instead of a cup of coffee. 2. What is shortening? (from a previous post) shops in England dont sell a product like shortening. P.s Your blog is great, stumbled on it through pintrest. 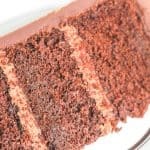 Love the top 25 baking a cake tips! For the chocolate butter cake, you can just sub really hot water for the coffee. That should work just fine. Ok let me just say ” TOO DIE FOR!!!! I made this recipe this weekend and i have tried many recipes with zero sucess and having to resort to box mixes. Now I am not sure what to do with the 20 cakes mixes I just bought…lol… This recipe is AMAZING!! it worked out perfectly and I am not a chocolate cake lover but “I am now”. I was so moist and melt in your mouth goodness. Ok maybe this is just to good to be true so I put it through test#2 ” my fussy eater kids, and daughter who doesn’t like cake or icing”, well guess what? She LOVED it!! So needless to say “out with old, in with the new”- this is my go to recipe now. I made cake and cupcakes and both were awesome. Thank-you so much for you post about trying ” a from scratch recipe” glad I did!! Wonderful! So glad you liked it! I’m not even a huge chocolate fan, but this is actually one of my favorites 😉 Thanks for leaving the comment! I loved the recipe and wanna give it a try. My question is, I can use white sugar instead of brown? I think it should be okay to substitute. The brown sugar gives it more of a richer flavor, but I think it’ll be fine subbing out regular sugar if you don’t have the brown sugar handy. Hi Zuki, Yes, I think it would work to sub out the oil for butter. I would take out the 1/4 cup oil and sub with 1/2 cup of butter. (That would be one stick of butter.) I haven’t tried it this way, so I can’t make any promises. The oil just adds in a little extra moisture, but in theory it should work to replace it with more butter. Let me know how it goes! Thank you Kara, for your response. Aloha! Would this cake be stable for multiple layers like a wedding cake? Hi Kara, can you tell me what is the weight of the butter it says sticks but I’m in uk so need to know equivalent weights. Hi Diane, a stick of butter is a half a cup in the US, which breaks down to 4 oz. or 113 grams. Hope this helps! Do you use salted or unsalted butter? Also I noticed you used baking soda, but there is no acidic ingredient such as buttermilk or lemon juice, so I am wondering if baking powder alone would be okay? Hi Linda, Use unsalted butter. It’s best for baking. Also natural cocoa powder is acidic so the baking soda combines with that to help with the rise. There are several options for replacing eggs in baked goods. I’m not an expert at it, but I found a link that lists several options. I have not personally tried these options for this cake though, so I’m not sure how they would work out, but I hope this helps a little. Hi! This cake sounds yummy. Would this recipe be good for cupcakes, as well? If so, Any changes needed to do so? 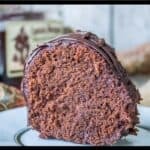 I’m from Australia and found your recipe the other day when looking for a moist chocolate cake for my grand daughter’s 12th birthday. I made your cake and it turned out beautifully except that both layers peaked which meant I had to cut the tops off and ended up with a slightly lower cake than I’d hoped for. In saying that though the cake was delicious and I’ll certainly be baking it again. Do you have any tips to stop them peaking? Thanks. Hi there…so glad you liked the cake. To lesson the peaks a bit, next time try baking at 325 instead of 350. You’ll have to bake it longer, so I’d start checking it at around 50 minutes or so, but you may have to bake it a little longer than that. Baking it at a lower temp, might help it rise a little slower. Let me know how it goes! Is this in degrees Celsius or Fahrenheit? I’m assuming Fahrenheit otherwise seems really hot! Hi Cara, I like your name 😉 Yes it’s in Fahrenheit. Hi there, I wouldn’t substitute syrup for cocoa. You most likely won’t get the same results. The flour amount, sugar and liquid in the recipe would all have to be recalculated to accommodate that change…I’m just not sure it would work properly. Sorry! I am going to try this recipe for easter! Do you recommend using light or dark brown sugar? Hi! You could use either one, but I use light brown sugar. This recipe sounds great! I am wondering how thin the batter is when you are finished mixing. I am looking for a thicker batter to make a checkerboard cake. Looking forward to making your cake. Was after a butter cake for a kids bday cake to decorate on top but a chocolate one so this is perfect ??. Just wondering, I have a square (with rounded corners) 10″ cake tin and intended on baking two to layer on top of eachother for height… would you recommend doubling the recipe to make the two cake layers or leaving the current quantity and dividing by two for this size tin? Also, wondering if should bake for a little less time given is a wider tin? Thanks so much for your assistance! Hi Nadia, Good questions. I would probably double the recipe to make 2, 10″ square cakes. You might have a tad bit extra batter, but I think just doing a recipe and a half wouldn’t be enough. If you do it that way, I wouldn’t bake it less time though. It’s a bigger pan, so it might take a little longer to bake actually (unless you’re wanting thinner cake layers and are not putting as much batter into the pans.) Hope this helps! Let me know how you like it! Best Chocolate cake I have found! All of my family, the taste testers, are in agreement! Thank you so much for the recipe! Just made a 4 tier wedding cake out of this recipe! I got so many compliments, the taste was fabulous! It held up well and stayed moist throughout the day. It was sitting outside in the heat, oh I was so worried!!! But it did not dry out, and according to many visitors, was the best chocolate cake they had ever eaten! Thank you so much for your wonderful recipe!! Hi Debra, That’s wonderful news and I’m so happy everyone liked it! Hi there! Just wanted to say that I also made this cake as a wedding cake. The 4 tier cake held up fantastic, didn’t dry out and I got numerous compliments about how wonderful the cake tasted! Thank you once again for the recipe! I will be trying out your vanilla bean cake next! Oh it’s good to know that buttermilk works well for the vanilla cake and I’m so glad you like it! 🙂 As for the coffee in this cake, I use one of those Keurig coffee machines to make mine and I usually choose the middle button, so I’m thinking that’s probably medium strength. You won’t really taste the coffee in the cake, so any strength should do, but if you want a stronger flavor, you could always go with a really strong brewed coffee. I go with medium, but basically the choice is yours. Hope this helps and let me know how it turns out! I tried this recipe yesterday both as cupcakes and a small cake. I must agree with you that it is the best chocolate cake I have ever baked. 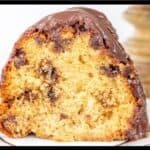 I have a client who does not like her cake with a lot of chocolate and this recipe is just perfect. I am also using your vanilla bean cake as one tier of the same order. Thanks! Oh Diana, this makes me so happy! I’m so glad you love it! I love this cake for the very same reason as your client. I don’t like chocolate overload and this one just has the perfect amount…in my opinion. Thanks for letting me know it turned out so well. I hope your client loves it too! My client loved both cakes. She wants me to save both recipes just for her. I think I will ask her for a photo of herself and attach it to the chocolate cake recipe LOL. I will be trying other recipes in the new year. I’m looking for a dense cake for my petit four and I’m thinking of using this recipe. Do you think the cake will still be good, structure wise if I decrease the amount of sugar? Hi Edel, This cake is a more dense cake, so I think it should be fine for petit fours. As far as decreasing the sugar, I wouldn’t decrease by much though because that can mess with the texture and moistness of the cake. Hope this helps! For the cocoa powder, I am not sure if you are using sweetened or unsweetened ; I will substitute Frye’s – is it ok if it is unsweetened or do I have to adjust sugar? Hi Nadine, I use unsweetened cocoa powder. I normally just use the Hershey’s brand, but I’m guessing any brand of unsweetened cocoa powder would do. I’m going to use your recipe using an 8x10x3 oblong cake tin but doing just one cake to the full height of the tin. Would using 1 and a half amounts be enough or would you recommend me splitting this amount and baking two? Yvonne, I’m thinking a recipe and a half would work just fine. I haven’t used an oblong cake pan, but I’m thinking that amount sounds about right for that size. Since it’ll be a little thicker than the average 2″ deep pan, you might have to bake it just a bit longer, but you can eyeball that and see how it looks. Let me know how it works out! Hiya Kara, thanks a lot for your prompt reply. I will definitely let you know how it turns out! Wish me luck. Hi there. Whole milk here is a type of milk but with a little more fat content in it than like 2% or skim milk. Any milk should be fine. I just say whole milk because it has fat in it and it works better, but you should be able to substitute it with any milk and it should be okay. I am a single man from Indiana. I recently lost my daughter and two grandaughters. Understandably I have been feel alone and down so I decided to make myself a birthday cake. I started my search with butter and chocolate, guess what? Your recipe came up. I followed the directions to the letter, including the coffee. I needed to go to the store for a few things, like everything but the coffee haha. It was difficult leaving the house for me but good to get out. Anyway sorry about the side story. I am trying to say this cake is good enough to feed Angel’s. The moistness is a ten and the chocolate flavor explodes on the tongue. Thank you for posting and or inventing this recipe. You made me happy for the first time in a while remembering how I used to bake with my girls. God Bless and keep inspiring you. Hi i want to try your chocolate cake but I need a white frosting on the outside. What would you suggest? I will forgo shortening which is unhealthy. I will layer the cake with your chocolate buttercream and cover the outside of whole cake with vanilla buttercream. Why do you opt for milk rather than sour cream? Hi there, I didn’t really want the tang of sour cream in this one, plus I felt like it didn’t needed anything extra to make it more moist. Hope this helps. Hi! I am a huge fan of your Vanilla Bean Cake! 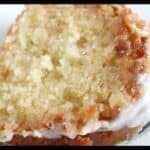 I wanted to know why you don’t use cake flour in this recipe and is the texture the same as the vanilla cake? Hi there, I like to change up my recipes sometimes, so some will use cake flour and some don’t. You could substitute cake flour for the all purpose flour if you wanted to, but I think it’s good with the all purpose flour. This cake probably isn’t as light and fluffy as the vanilla bean cake. It has a heavier, more dense texture to it, which I think goes really well with the chocolate flavor, but it’s very moist. Hope this helps and I’m so glad you like the vanilla cake! Hi there! Would this cake be okay to make in advance? Say 3 days.. or should it be frozen in the mean time? TIA! Hi Melissa, it should still be good on the third day. To get maximum freshness though, if you have time to make it ahead and freeze it, that would work as well. Hi! Could someone please tell me if the recipe would stay the same for a 9×13 pan? Thanks so much! I have not tested out this recipe in a 13×9 inch pan, but in theory, it should work just fine. You shouldn’t need to make any adjustments to it. Hi Natasha, not sure about baking with the fan, so I’m just gonna say fan off. If you bake it in 3, 6″ pans, it’ll probably be around 4 1/2 – 5 inches tall without the filling and frosting. If you do decide to bake in the 6″ pans instead of the 8″ pans, start checking for doneness a bit earlier than it says. Hope this helps and let me know how it turns out! 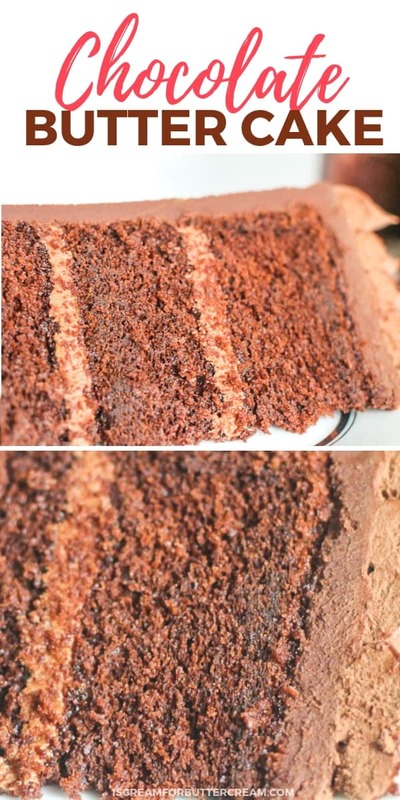 im wondering what exact cake pan size you use for this recipe ? Crystal, I used two, 8″ round pans that were 2″ deep. Hi there… I wanted to make a 3D car cake. Can I use this recipe for it? Is this recommended for carving cake?